Although the rules for roulette tables are designed in such a way that the bank makes money in the long run, it must be said that roulette is a pretty fair game. If you play with only small amounts (relative to your chips), then you can gamble for a long time at the roulette table whilst having a lot of fun. This article shows you how to calculate probabilities in roulette, including the odds for each type of bet, allowing you to analyse all the possible variations. The calculation of roulette wheel probabilities is very simple. Let us take the classic example of a dice with the numbers one to six. How large is the probability that the next throw is the number five? Of course, it is 1/6 or 16.67%: only one side of the dice has the number five, one of six numbers in total. And how big is the probability of getting a number that is at least four? The answer is 50%: there are three possible throws (numbers four, five and six), meaning a three in six chance, or 1/2. If you have understood these simple examples then you will also be able to understand the probabilities expected in roulette. Lastly, there is an additional stand-alone number, which is the green “zero”, making 37 numbered zones in total. The zero is not included in any of the three sets above. then your likelihood to win is 18/37 = 48.65%. If your bet wins, your stake is returned plus 100%. In effect you double your money as each of these sets is an ‘evens’ bet. Assuming the frequency of results is uniform (i.e. each number appears once during every 37 rotations), the bank will win all bets placed on the three sets every 37th round, when the green zero arrives. Thus, players lose an average of 1/37 of their stakes (assuming that they always play with the same stake per round). Putting this another way, imagine you are betting on both the “red” and “black” sets at the same time. On average, 36 out of 37 times, the roulette ball will land on a number from one to 36. You are backing all 36 numbers and will lose one bet each time but receive full compensation on the other. (A zero sum game). But you will make a total loss (lose both bets) when the ball lands on zero, and this is precisely the case in 1/37 of the games. So you can say that with simple chance you should expect returns of 36/37 of your stake money, which is the expected value in roulette (97.3%). In other words, for every 100 units staked you will receive back an average of only 97.3 units. There are some casinos which are a little fairer to players who rely on simple chance. 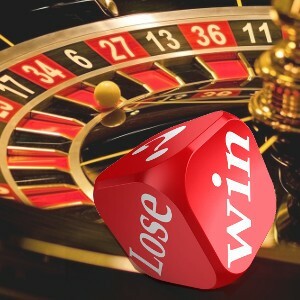 In such a casino when betting on, for example, red, if a zero appears your stake is not lost immediately but is left to ride on the next spin of the wheel. In this case, the stake is returned to you (without winnings) if the next spin is “red”. The expectancy value for this type of house increases a gambler’s chances to 98.65%, or 98.65 units returned per 100 unit stake. Wagering with 100 units in a session will cost an average of 1.35 units (the house “edge”). You’ll find further maths and explanations in Wikipedia here. If you witness “red” five times in a row, what do you think should come next? Red or black? Many will believe that the chances for “black” are now higher. Black has not appeared for a while so it must surely arrive again soon to ‘balance out the frequency’. Unfortunately, this thinking is incorrect. Following a series of “red” five times in a row, the probability for black always remains the same: 18/37 = 48.65%. Just remember the roulette wheel has no memory – it simply does not know what the last number was. This is why it makes no sense to write down the sequence of red and black. (Surely you must have observed gamblers in casinos engaging in this habit?). It is impossible to detect even the smallest patterns in the roulette wheel because the ball has no memory and will always churn out numbers completely at random. (18/37) ^ 6 = 1.3% (i.e. 48.65% x 48.65% x 48.65% x 48.65% x 48.65% x 48.65%). (For more explanations see also our combinatorics article). By the way, this is approximately half the chance that any one single number appears (1/37 = 2.7%) and, of course, it is just as unlikely that there will be red numbers five times in a row followed by a black number; the probability for this sequence is also 1.3%. Never confuse these probabilities with the “conditional probabilities”. The chance of red four times in a row is 5.6% but if you come to the table immediately after a red number has appeared, the probability that you will witness a further three reds (making a total of four times in a row) is 11.5% – purely because you will be observing only a series of three rounds. The law of small numbers was first conceived in 1898 by Ladislaus Bortkiewicz (1868-1931). His book is still available in German, free of copyright, and can be downloaded as a PDF or Kindle version. An English language introductory text is also available. The Law of Small Numbers is not exactly bedtime reading material, but here is a brief summary. As roulette is a game of repetitions the “law of a third” and the “law of two-thirds” should become evident as play continues. The law of large numbers states that with an increase of repetitions the actual observed frequency comes closer to the theoretically calculated probabilities. Although it is possible to observe on one particular evening, for example, red numbers coming up 60 times in a row, and another evening 40 times black, ultimately, when you observe the distribution of red and black over a longer period, the frequency will be closer to 50:50. Therefore, there is no roulette system with which you can beat the probabilities. It may seem for a short time that a certain system functions but, in the long run, you will lose money with every system because roulette rules are designed in a way that the casino earns money. Period. Bear this in mind when you play roulette, but it is still fun! We hope that this article about roulette and its probabilities has helped you. Now it’s time to enjoy. All you need is a serious and decent online casino where you can test your newly acquired knowledge. Choosing a suitable casino is best done via a comparison site. Here is one: Australia Online Casinos – Check it out, choose your casino and then put your roulette theory into practice!